Last season, only a few club teams saw success over their school-based counterparts. This time around, two of the league’s clubs were able to score stunners in just the second week of the PFF Women’s League. 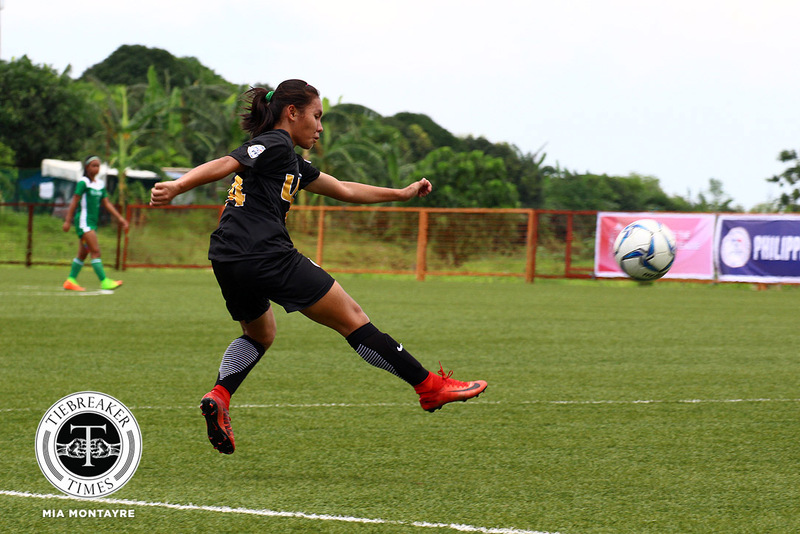 Tuloy FC, a modest club hailing from Alabang and backed by the Tuloy Sa Don Bosco Foundation, made heads turn two Saturdays ago when they were beaten only by a single goal by defending league and UAAP champions De La Salle University Lady Booters. Interest surrounding the club that only joined the league this season heightened after their second fixture matched them against another UAAP team in Ateneo de Manila University Lady Eagles who this time, they defeated, 2-1. 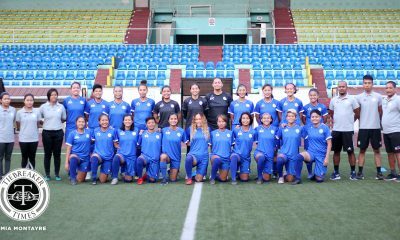 It was the rookies from Alabang that led first in the 26th minute after a counterattack produced a Mariane Caparros error that sent the ball straight into the feet of Jenny Perez who slotted it home. This roused the Lady Eagles who may still be feeling first-game rustiness to elevate their play and while an earlier goal from a free kick situation was waved off for offside, an equalizer was still inevitable as Nicole Bugayong put away a Tessa Bernardo cross in the 59th minute. 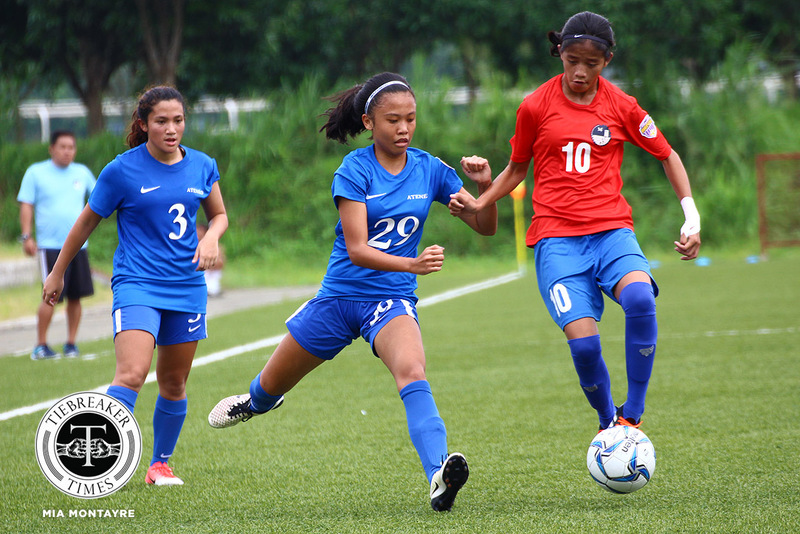 Ateneo’s pressure seemed to be wearing out their younger opponents until the substitution of injured captain Isabella Bandoja brought life back to the girls of Tuloy. Even with her left hand heavily bandaged, Bandoja fearlessly dove straight into attack culminating in a brilliant game winner in stoppage time where she corralled a short cross into the penalty area before outmaneuvering her marker and Caparros. Coach Rey Cuenco could not hide his joy with his side’s stunning win. “Malaking bagay kasi nakalaban na namin ang Ateneo dati sa mga friendly matches. Hirap kami sa kanila noon. Ito ang first time namin manalo,” he said before admitting his team still has a lot to work on yet promised good effort. “Dahil bata pa din sila madali mawala yung focus. Actually yung 11-a-side hindi talaga kami naglalaro nun, so yung rules at knowledge about 11-a-side ngayon palang nila na-adopt. Basta sigurado gagawin namin yung best ng team, kahit sino ang katapat namin.” Cuenco added. With plenty of new players filling their ranks, the De La Salle University Lady Booters are still looking for more consistency after their previous underwhelming win against newcomers Tuloy FC. 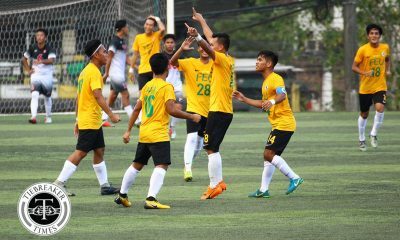 The signs are looking good for the Taft-based squad in their latest win over Hiraya FC where they managed four goals against a club that finished last season in the top half. It didn’t take long for the ladies in green to score after Sara Castañeda took advantage of an errant pass in the 4th minute that wrong-footed goalkeeper Haya Ibarra. 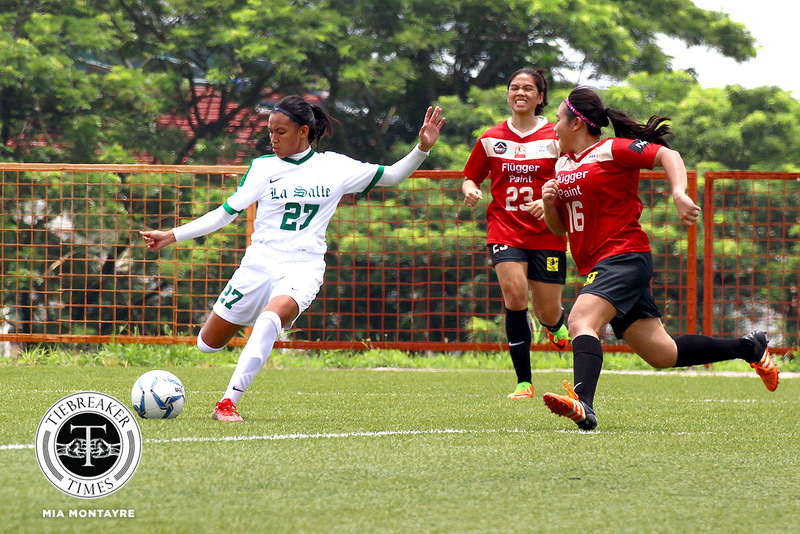 Ten minutes later a penetrating run saw Rocelle Mendaño tap in an Alisha Del Campo through-ball to double DLSU’s lead. Del Campo turned scorer in the second half starting four minutes in when she beat her defender for a nifty flick over Ibarra in a tight angle. Some twenty minutes later, Del Campo locked onto a short cross down the middle before beating Ibarra again to bring the score 4 to nothing. 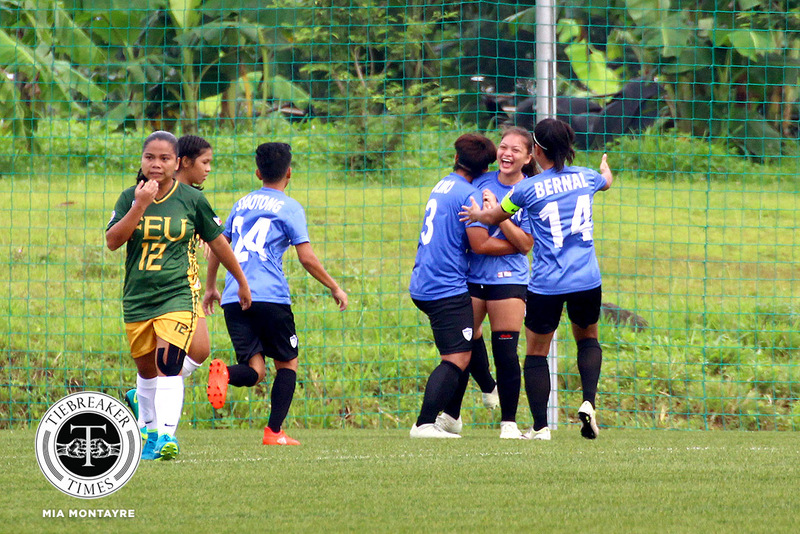 Both the Far Eastern University Lady Tamaraws and OutKast FC were going into this match with wins under their belt. Both teams are also very familiar with each other with many of the latter’s members notable alumni of the former. Yet OutKast’s experience gave their team the edge in this encounter that took advantage of a team struggling with chemistry to take a 2-0 win. The morning took on a relaxed atmosphere until Lindsay Whaley’s 9th minute strike gave the ladies in blue a surprising early lead. This clearly unsettled the Lady Tamaraws who rushed to take the match back. However, this proved to be their undoing as the veterans of OutKast rollicked in their loss of composure while outmuscling their virtual juniors out of their comfort zone in the process. The times the ladies of Morayta broke through the defensive ranks, seasoned custodian Jayneth Mercado easily dealt with them even using a bit of gamesmanship. In the 73rd minute, OutKast nailed the coffin when substitute Marianne Narciso effortlessly guided the ball past goalie Kimberly Pariña after Loreta Ladero’s through pass. Keuts Smith who has been managing the club since its inception was very pleased of the result before turning cautious of what will come. “We are very happy of course because having a second victory is very important in giving us confidence,” she said. Smith also gave credit to their preseason gym training which improved her players’ stamina. “We managed to get sponsorship with Anytime Fitness so a lot of the girls went to the gym because they knew not getting to run very much was one of our weaknesses. And it helped the girls get into a confidence that we can prepare,” she added. The University of Santo Tomas Lady Booters were riding high on a dominant first win going into their second fixture and appear to not take their foot off the gas pedal after completely overwhelming high school team De La Salle Zobel 12-0, giving the UAAP and PFFWL runners-up a commanding position at the top of the table via goal difference. 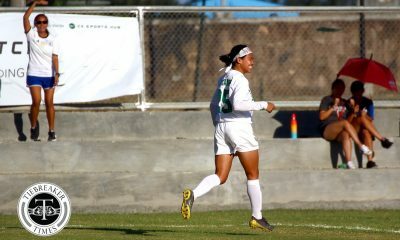 Shelah Mae Cadag scored the fastest goal to date with her 2nd minute strike before netting the second seven minutes later. By the time she completed her hat-trick four minutes after that, another UST win seemed like a foregone conclusion. In total, she pocketed eight goals from the contest, scoring two more in the first half (26th and 38th minutes) then a hat-trick of goals in the second (56th, 68th and 75th minutes) before switching to defense. Rachelle Hope Sanchez added a brace in the 47th and 79th minutes which included an accidental strike that was initially meant to be a pass. Ronalyn Lagata and Nina Yanto added goals apiece in the 65th and 89th minutes. 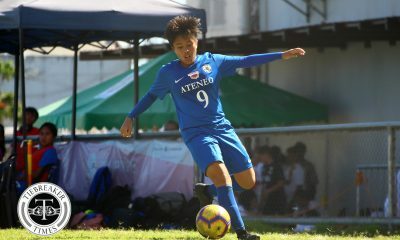 Lagata, who hails from Payatas and is a proud member of the Fairplay For All Foundation and a Philippine representative at the Street Child World Cup, is the only rookie among the scorers who also assisted Sanchez’s first header goal. Despite getting rained on with a ruthless barrage of goals, credit to the girls from Alabang for continuing to attack and often reaching the final third with the most promising chance coming from a Marinelle Cristobal spurt that was only halted by goaltender Nicole Reyes. Tactician Aging Rubio continued to be hard to please as she expressed dissatisfaction on her young squad’s showing. “Magulo pa rin sobra, kasi meron akong tinitingnan na play na gusto ko maintindihan ng mga bago. Kung mapapansin niyo, lahat ng first eleven ko puro halos bago kasi gusto ko kasi silang humabol. Ito kasi yung opportunity na makita namin kung ma-apply ng mga bago yung play ng UST,” she said. Rubio also explained this was exactly why she kept Cadag in attack despite already scoring a ridiculous number of goals. The PFF Women’s League continues on Saturday, September 8 at the PFF National Training Centre in Carmona, Cavite where the Green Archers United FC face sister team De La Salle Zobel at 8:00 A.M. followed by University of the Philippines looking for their first win against OutKast FC at 10:30 A.M.
On Sunday, September 9, another all UAAP affair awaits with University of Santo Tomas clashing with Ateneo de Manila University at 8:00 A.M. and will be followed by Far Eastern University hoping to bounce back against Hiraya FC at 10:30 A.M.